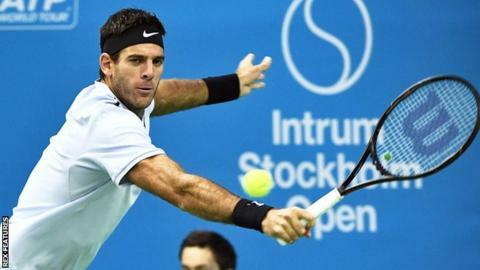 Argentine Juan Martin del Potro retained his Stockholm title with a 6-4 6-2 victory over Bulgaria's Grigor Dimitrov. Del Potro claimed his first title of the season and the 20th of his career in just one hour and 25 minutes. The world number 19 broke at 2-2 in the first set before serving nine aces in total as Dimitrov failed to convert any of his four break points. "I played the best match of the week against Grigor today," said Del Potro. "Unlucky for that, sorry Grigor. It's amazing to come back and hold this big trophy." Del Potro has made a late-season charge to put himself within striking distance of qualifying for the ATP tour finals in London. The 29-year-old has now climbed to 14th in the ranking, 470 points behind Pablo Carreno Busta, who currently occupies the final qualifying spot. Dimitrov, meanwhile, is fifth in the race to London and nearing his first appearance at the end-of-season finals. In Antwerp, world number 17 Jo-Wilfried Tsonga beat 26th-ranked Argentine Diego Schwartzman in the final of the European Open. The Frenchman won 6-3 7-5 to claim his fourth title of 2017.